Union Pacific 4014, one of the "Big Boy" steam locomotives, was donated to the city of Ponoma, California in 1961. For half a century it sat out in the open on display at the Ponoma Fairgrounds, but it was cared for and painted. Someone even lubricated the wheel bearings every year or so. Now it's coming back. The wheels and bearings were checked and lubricated, and enough maintenance was done that the big engine could be towed. Temporary track was built across the parking lot to the tracks of the LA transit system. The Big Boy was towed across the parking lot on the temporary track by several earthmoving machines, until it reached live track. There it was coupled up to a work train with four Diesel locomotives and some hopper cars for brake ballast (the Big Boy's brake system isn't functional yet) and towed, slowly, on Metrolink track to a connection point with Union Pacific track. Once on heavy duty Union Pacific rails, they were able to pick up the speed a little and towed it to Union Pacific's yard at West Coulton, CA. There it will undergo more maintenance for a month or so, after which it will be towed to UP's engine shops in Cheyenne, Wyoming for full restoration, conversion to oil, and a return to main-line operation for fan trips and PR. This will be by far the biggest steam locomotive in operation. I think I posted about this one a few months ago, but I hadn't seen the newer photos. Thanks! I thought I remembered an earlier thread. That would be back in the project's "paperwork" phase. Nice to see it moving forward. If you're really into this, the video is worth watching to see blue-collar work done well. The backhoe operator uses a pointed lifting hook precisely, nudging rails into position. The skid-steer loader operator uses a huge bucket to put small amounts of ballast gravel where they're wanted. They have all the right power hand tools for cutting rails, welding rails, and bolting rails. Everything gets done with little fuss or drama. When they finally tow out the Big Boy, it's at one foot per minute. The Diesel locomotive doing the towing tows over a million pounds of locomotive with little effort and precise control. The turn to the temporary track is tighter than the Big Boy's 14-wheel tender was intended to handle, but at very slow speed, it made it. The locomotive doing the towing, an ordinary modern Diesel-electric EMD SD70ACe with AC motors and solid state inverters, has more tractive effort, 157,000 lbf, than the Big Boy, at 135,375 lbf. This, frankly, is why giant steam locomotives are no longer used. The engine is magnificent and the work crews are awesome. If memory serves the Big Boys were built to move long trains over the Rockies, when diesels were not up to the job. Pretty much. As I understand it, the Big Boys and other Mallets (rigid boiler, articulated frame, compound engines) were intended to put as much horsepower as possible under a single operator in the days before diesels gained multiple-unit-control capabilities. Otherwise, heavy trains required multiple locomotives, each with its own driver and fireman, and the drivers had a right time of it trying to coördinate throttle and valve cutoff, usually by whistle signals. 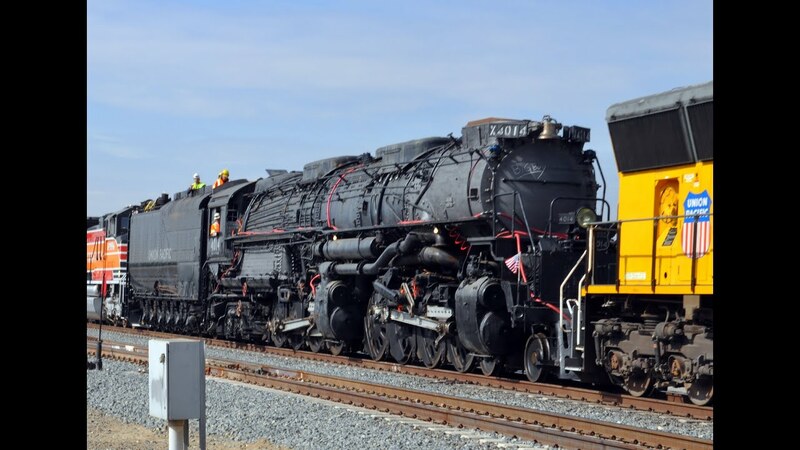 The Big Boy will be restored for operation at the UP's steam shops in Cheyenne , Wyoming. They also maintain the 8444 Northern and 3985 Challlenger there. The Big Boy and the Challenger are in fact , not Mallets at all. They are " Simple Articulated " locomotives. The cylinders sets on each loco are the same size for the specific engine . They do not use steam twice as a compound does. True Mallets were the Y6b's on the Norfolk and Western . These were compound locos built in 1948 by the company shops in Roanoke, Virginia. Oh I see, there will be an oil fire under the boiler? The area of the firebox on the boiler is 150 square feet. I had the oppurtunity to look into the firebox of one on display here in Denver, it is like a small room inside. They will adapt the firebox with an oilburner unit and fit the tender coal space with an oil tank. The oil will be pumped forward into an atomizer and sprayed into the firebox to be burned. If you watch videos of 3985 out running on the mainline, you can see that the fire is very clean burning when running. At the end of operations of the Big Boys , they were pulling 6,000 ton trains west out of Cheyenne over the Continental Divide . They improved upon the original design requirements of 3,600 ton train to start with in 1941. Right. I didn't give background on UP's team operations. Read about them here. The Union Pacific still runs a few steam locomotives, the only US Class I railroad to do so. They already have the big shops and heavy equipment needed for maintenance. The Big Boy will go into the UP's maintenance shops at Cheyenne, Wyoming, where UP does heavy locomotive repair. Now with AC traction and computer control of the motor units one loco can put more tractive effort to the rails. The computer can sense wheel slip on a single axle and add sand or reduce the power to the slipping wheel. Steam locomotive in China, 2012, being used in an open pit mine. It's kind of cool that they're using steam, but this is the wrong locomotive for the job. That's a Chinese JS-class freight road locomotive, built from the 1960s to the 1980s. It's not intended for steep grades. The mine probably got one very cheap, since they've been phased out on the main lines. Also, they're running it backwards, which is usually OK, but the sander can't help with traction problems. The track is curved and up a slor to be in pe. It does not appear to be in good condition. The bed looks to be uneven and in bad shape, and the engine seems overloaded as well as badly needing maintenance. I don't think steam was the problem. Nice to see they are putting this monster of the steam age back into service! The Big Boy is headed from the Los Angeles area back to the Cheyenne, Wyoming shops for overhaul on April 28th. Here's the schedule. There will be several stops for viewing on the trip. The Big Boy isn't in steam, but can now be towed on UP main-line track. Union Pacific plans to have the loco fully operational in 2017. I wonder what effect the oil conversion will have on it's performance (Someone in Britain once got caught speeding in a traction engine that used oil firing instead of coal and the judge wouldn't believe it could go that fast so threw the case out). Also will be easier for the maintenance crew as it shouldn't need the boiler tubes sweeping anywhere near as often. It is one seriously heavy duty piece of equipment. Union Pacific has 32,000 miles of mainline track, and they'll be able to take this engine anywhere on their system. There are no more coaling stations or ash pits, but oil and water are available. That's the great part of this project. This giant engine isn't confined to short trips on some heritage railroad. Our local heritage railroad, the Niles Canyon Railway, doesn't have a turntable or a turnaround loop. They have about a dozen miles of single track. So they often run trains with a steam engine on one end, and a Diesel on the other to tow the steam engine back to the start. Grin, they are just competing with us. It is that old AT&SF vs. UP thing, we should have the 2926 in steam by mid 2015. May 10 in ABQ we will have our locomotive down town for national train day. When complete we should have the most powerful non articulated steamer in the world. The latest calculations give us right at 89,000 lb. of draw bar pull, Grin. Take a look at our photo archives, warning, it could be a real time sink. That is me in the red shirt. Photo page for our last open house event. pardon me if this sounds disrespectful, but I thought steam locomotives went in reverse as fast as they did ahead. Why not just go in reverse? One of the beauties of steam locomotives was that anything that could be a heat source worked as a fuel. So we already have efficient engines that can run on renewable fuels. The awesome power and Majesty of a steam locomotive is an experience not to be missed. My thanks to those who care for these magnificent machines. Your comments on continued use of steam engines in China has been confirmed by a friend of mine who is an expert on Oriental transportation modes. His name is Major Rick Shaw.